WELCOME TO THE BOAT-BOARD “HOME” PAGE!!! 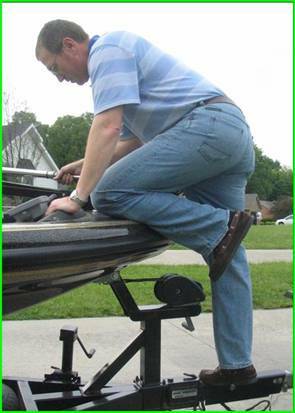 At Boat-Board.com we are committed to providing products and methods to improve safety and make it easier to board and exit a boat when loaded on its trailer. When having fun on the water is your goal, the last thing anyone wants is an accident that could cause injury and put a damper on the trip! If ‘Yes’ is the answer, then you have come to the right place! Boarding a boat on its trailer, from the bow, is a difficult task. Exiting the boat can even be more difficult. And “high bow” boats can make the process nearly impossible, putting a person into a dangerous situation! Take a look at the man pictured to the right. A slip or fall from this position could cause serious personal injury, either while launching/loading or just sitting in storage. Consider that during the launching/loading process the boat and trailer are in the water and the person boarding or exiting the boat bow is over the water. If you fall with nobody around...the result could even be deadly! Conventional trailer designs rarely provide any features to make the process safe and easy. 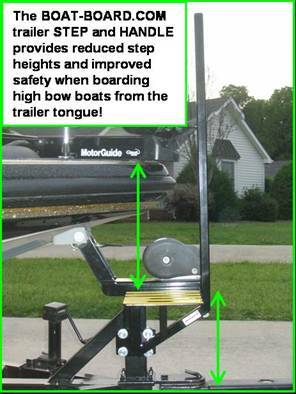 Those that do fall short of the many advantages that the boat-board.com trailer STEP AND HANDLE provides! BOAT-BOARD.COM has developed an “original and innovative” solution to make the boat boarding and exiting process safe, easy, and fast!!! Check out the following topics by simply clicking the links at the top of the page to find out more and discover some innovative solutions to make your boating experience “safe and easy...it’s our mission!” – EST. 2008.